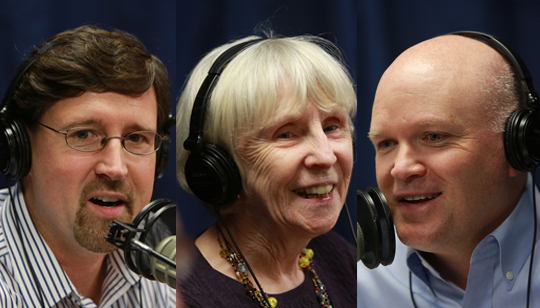 Summary of Today’s Show: Scot Landry, Susan Abbott , and Gregory Tracy discuss local, national, and international Catholic news. 1st segment: Scot said that on of the main stories on the pilot this week is about the 10 men to be ordained deacons this Saturday by Cardinal Sean at the Cathedral of the Holy Cross. Greg noted that having only 10 men this time allows the pilot to profile a little about each of the men. Greg also noted that something new to the diaconate program is that on top of a parish assignment the deacons are also being assigned to help with a ministry here at the pastoral center. Scot congratulated all men and ask everyone’s prayers. Scot said that the Pilot has several articles on the Physician Assisted Suicide issue and Cardinal Sean started a series of articles on the issue starting this week with the article on Better ways to care for the dying where he talks about Mother Theresa’s care for the dying and also talks about palliative care and the way of hospice. Greg noted that today we don’t want face that one day we will die and we are afraid of the unknown. Scot commented that in this article Cardinal Sean article highlights compassionate care and ways to deal with the fear of the unknown. Susan said that one of things the church does and should continue to do is to show the support that is available not only for the sick but also for their family. Scot highlighted the events and educational workshops on Physician Assisted Suicide around the Archdiocese which will be on the Pilot this week. Scot mentioned the article from the Pilot reporter Chris Pineo regarding the physician from Oregon, Dr. Kenneth Stevens, who spoke at the Pastoral Center about “the reality of physician assisted suicide in Oregon and what it means to Massachusetts.” Greg said that this presentation beings another perspective on this issue because it highlights that assisted suicide is based o an ideology and not science because killing is not care, it’s a shortcut. Scot said that there are many arguments against physician assisted suicide including faith, the medical community and that they are all listed on both the Archdiocesan education website and the Committee Against Assisted Suicide website. Scot noted that effective October 22nd, Fr. James Savage is returning to St. Eulalia’s Parish in Winchester after many years. Susan mentioned she met him once before because of his involvement with religious education. Scot mentioned that Boston College opened its 150th anniversary celebration with Mass at the Fenway on September 15th. Scot said that the Cardinal was overjoyed to see so many people together for Mass at Fenway. Greg said that he was there covering the story, and that it was a beautiful celebration and that the event brought together two great icons of Boston, Fenway Park and Boston College. Susan said she could not make to the Mass, but that herself, her husband and her daughter are graduates of BC and that she was able to watch it online and it looked beautiful. Scot announced that today TGCL was going to give away 3 copies of the movie For Greater Glory for the first 3 people who either post on the chat screen at BostonCatholicLive.com or sends an email to The Good Catholic Life. Scot talked about the article on the Anchor regarding the Choose Life License Plate and congratulated Merry Nordeen, president and founder of the non-profit Chose Life, Inc. for the her wonderful on this campaign. Scot said that the money raised with the license plate campaign will be deployed to help numerous pro-life organizations and that he is always inspired by lay people who work for pro-life and for the church and that he hopes to have Merry on The Good Catholic Life in near future. Greg noted that the license plate program is great because every time you renew your license plate the organization gets the donation again. Susan said that this is great campaign and you know that the money is going towards providing great resources. Scot mentioned Pope Benedict’s visit to the Lebanon at the hype of the Middle East Crisis and that he thought that he was going to cancel the trip but that his visit serves as a great witness to the many Christians in the Middle East and also for the support of religious freedom. Susan said that this trip underscored the Pope’s care for the country and their people. Greg said that this was an important trip and comes at the right time, as there are thousands of Christians fleeing from the Middle East because they face persecution and this is a call for religious tolerance. Scot talked about all of the publicity regarding the papyrus fragment with reference to Jesus’ “wife.” Scot said this was blown out of proportion as it is a document with only a few words and from several hundred years after the death of Jesus. Susan noted that its an interesting story but does not provide evidences and that even the person bringing this document forward said that it does not prove anything. Greg said that the headlines on all of the articles he read were just an attempt to sell papers and that several articles listed many arguments that this is not credible but that it also posed the question regarding the disciplines of the Church regarding priests celibacy. Scot announced that Susan, Louise and Karla were the winners of a DVD copy of the movie For Greater Glory. Scot apologized for the technical problem that did not allow Fr. Roger to be at the show today but that he will be with us next week to talk about his trip Lourdes.